When Barack Obama took office in January of 2009 the U.S. was emerging from the recession that began in December of 2007. Running 18 months, this was a significant recession, with GDP reaching -8 percent in 2008 and unemployment peaking at 10.0 percent in October 2009, four months after the technical end of the recession. In February 2009 President Obama signed the American Recovery and Reinvestment Act into law, an $830 billion spending plan that was supposed to keep unemployment from rising above 8 percent. It didn’t. Truthfully, seven full years later the United States has not fully recovered from the recession, and Obama blamed the recession throughout most of his presidency to cover his tracks on the poor economic recovery. But the severity of the recession wasn’t to blame. Gross Domestic Product growth has been inconsistent during Obama’s presidency, and averaged slightly above the 2.0 percent range. And while unemployment finally dropped to respectable territory at 4.9 percent in January, that must be considered in light of the fact that it’s only that low because more than 90 million Americans couldn’t find a job to replace the one they once had and left the workforce. When those people are included in the calculation, the unemployment rate at the end of April was 9.3 percent (U-6). The labor force participation rate is the percentage of working-age persons in an economy who are employed, or are unemployed but looking for a job. Today, according to the Bureau of Labor Standards, the participation rate is 62.8 percent, the lowest since the 1970s. 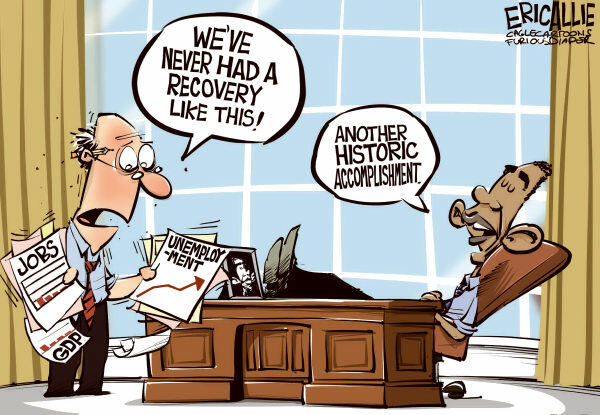 Contrast Obama’s dreary results with the last recession that lasted at least 16 months. During Ronald Reagan’s first term, the recession began in July 1981 and ended in November 1982. Under Reagan’s policies the unemployment rate fell from a high of 10.8 percent in December 1982 to 7.2 percent in November of 1984 – that’s a 3.6 point improvement in 23 months, a striking difference from the 2007 recession, where unemployment peaked at 10.0 percent and never fell below 8.0 percent in the first 43 months afterward. During the Reagan recovery the economy posted a robust 4.8 percent annualized growth over 23 quarters, according to economist Stephen Moore in The Daily Signal, and that was more than double the rate during Obama’s tenure. Where Obama responded to an economic recession with $2 trillion worth of government expansion (more than $1 trillion on health care and $830 million in economic stimulus), Reagan cut marginal income tax rates across the board permanently through the Economic Recovery Tax Act of 1981: Different approach; different results. Reagan’s results were far better. When your country is in trouble the president is supposed to put political and ideological goals aside and take actions that help the country recover. Instead Obama, not one to let a crisis go to waste, pursued his manic pledge to “fundamentally transform” the country, doubling down on reckless environmental policies that since September of 2014 have cost 191,000 people in mining industries their jobs, about 30 percent of them in the coal industry, according to CNS News, citing data from the Bureau of Labor Statistics. She then visited West Virginia coal country on the campaign trail and faced an out-of-work coal miner who is having trouble taking care of his family because of the Obama administration’s punishing policies on mining and burning coal. She answered his complaint about killing the coal industry by saying that her comment was out of context and that she had a plan to help families and individuals who have been put out of work. But there are two problems. First, in her initial statement she clearly promised to kill coal jobs. For a candidate for president to advocate a policy of deliberately targeting a group of jobs that are legal ought to be disqualifying. Furthermore, Clinton said the focus would be retraining those out of work for new jobs. And just what sort of new jobs would there be in this situation and in a state so terribly wracked by Obama-caused economic woes? Obama’s policies have inflicted great pain on the nation, and Hillary Clinton gives every indication of continuing along a similar line. So much of what liberal Democrats have done and will do is to shove their ideas down our throats, instead of allowing change to evolve naturally. People who live in coal producing states understand quite well the damage such policies cause. I guess they aren't talented enough to discover such things.